We were sad to leave the Cameron Highlands but we were also looking forward to our next destination. We were headed for the remote Perhentian Islands on the north east coast. 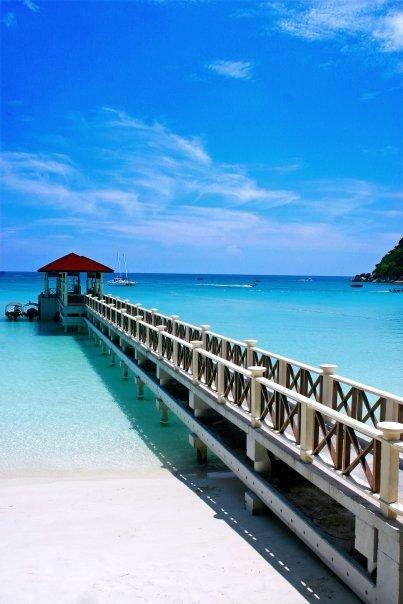 The Perhentians are part of a National Marine Park and are stunning! They're probably as close as you will get to an island paradise in South East Asia without stepping so far off the tourist trail that you're simply stranded on island with nothing but coconuts. Our journey there was arduous but worth it as soon as we were on the boat and could look down in to the beautifully clear waters of the South China Sea. The depth had to be close to 15 meters and we could see sun shimming off the sand at the bottom! At first we headed to the smaller island called Kecil and the backpacker area of Long Beach (ironically not all that long...). We originally had high hopes for this beach because our guidebook raved about it and after seeing the quality of the beaches that other people were stopping at - our mouths were watering at the prospect. Sadly however, we were let down. Long Beach had its charms but they were mainly swallowed by the people (locals and travellers alike) on the island. It felt like it could have been ANY beach in South East Asia and not the tropical, remote paradise we were expecting. So we moved to the larger island of Besar where we found one of the most lovely beaches we've seen. I went diving there (the Perhentians are rated as one of the top 10 dive sites in the world) and Lisa and I went out snorkelling together. We saw so much life just a little way off the beach: Sharks, large Parrotfish and Wrasse, Squid, Clown Fish, and much more. Lisa is certainly getting more confident with being in/under the water - so much so she began chasing a small (1m) Black Tip Reef Shark through the water to get a photo! Fearless! At first we felt disappointed by the Perhentians, but after our move to Besar wefelt much better. The peace and quiet of the tropical paradise was just lovely. I will miss the water here - it is just crystal clear and bursting with life.